In 2019, SAYes Mentoring, in partnership with the Western Cape Education Department, is launching our schools programmes in Hout Bay at two high schools (Silikamva High School and Hout Bay High School). We are excited to offer our formal mentorship model to the great community of Hout Bay, reducing social inequalities through effective and boundaried behavioural interventions, and supporting objective improvements in independence and well-being. SAYes provides a structured, formal mentoring programme for young people growing up in challenging circumstances who are preparing to transition to independence. SAYes matches young people with volunteer mentors and provides a framework and ecosystem of specialised staff and resources to support the mentorship process. SAYes believes that the guidance, advocacy and support provided by mentors is key to preparing young people for independence and inspiring meaningful social change. 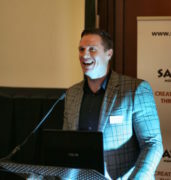 Founded in 2008, SAYes has now grown to more than 100 mentor-mentee matches and, over the last 10 years, it has facilitated 15,750 hours of mentoring for 392 young people in the Cape Town area. 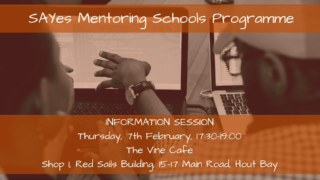 Through the programme, mentors and mentees undergo mentorship training and then meet for weekly mentoring sessions. Throughout the year, mentor/mentee matches also attend monthly work-groups designed by SAYes to guide mentees towards improving independence and well-being as they approach adulthood.